Has anyone ever started a rumor about you? 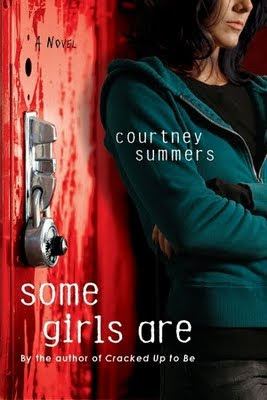 This is the problem Regina Afton faces in Some Girls Are by Courtney Summers. Regina is part of the Fearsome Fivesome, the clique on the very top of the social ladder at Hallowell High. The Fearsome Fivesome is feared by the students, yet envied by nearly everyone. But when they cast Regina out of the group in a freeze-out after nasty rumors were spread, she gets a taste of her own medicine. Soon the entire school completely hates her, and lets her know by spray painting words like "whore" across her locker and posting awful comments and rumors about her on the internet. The people she thought were her friends beat her down not only mentally, but physically as well. They abuse her for a crime she didn't commit. Regina becomes an outcast. The only people she can find refuge with are people she has abused in the past. Liz, a girl who was abused by the Fearsome Fivesome so badly she attempted suicide, is one of the only people who treat Regina kindly. She doesn't accept Regina as a friend or forgive her for what she's done in the past, but she is not mean to her like everyone else. Regina is astonished that Micheal is the one person who she can actually call her friend, when she's the reason he is an outsider and a loner at school. She is even more astonished that she begins to have feelings for him, like more than friend. Can you imagine this happening to you during your senior year ? What I found compelling about this book was how much I hated the characters. You might think that's odd to say about a book I enjoyed, but I thought that was what Courtney Summers was going for when she wrote it. I think she wanted readers to see how truly mean teenagers can be when left with no consequences. As a thirteen year old in junior high I know how teenage girls are prone to act. I haven't seen any girls bully to this extent, but I can see how it could get there if their actions had no repercussions. This is a book that is very important for teen girls to read because it puts them in the shoes of someone who knows how it feels to be be bullied. It shows you, as a reader, the repercussions your words and actions have. When adults just tell you that someone is hurting that doesn't always change your view or teach you that what you say really does hurt people. By reading about it you see through the eyes of the victim. But Regina is not only a victim, she has victimized others and gets to see first hand how it feels to be treated how she treated others. What made Some Girls Are interesting is that it was real. It didn't sound like an adult writing teenage characters how they should act, but how they would act in this kind of situation. I read this book in a day. I literally couldn't put it down, except for once to eat. And that was against my will. I recommend this book to readers thirteen and up based on language and violence. I wouldn't stop younger readers from reading this based on the language because they've surely witnessed worse on TV, at school, or just hanging out with friends. If you're a parent and your kids are old enough to hang out with friends, unchaperoned, then they have probably seen this kind of behavior first hand, and this book might put things into perspective for them. If you are a teenager then you should check out this book because it might change your opinion on some of your so-called “friends”.